This is a guest post by Kris Lindahl. In the mid-1980s, one quarter of American men participated in the workforce, according to The Economist. Today, that number has risen to 40%. In the last 25 years, the number of 60- to 64-year-old men in the workforce has risen from 53% to 63%. The increase in older workers is similar for women, and is also occurring in other parts of the world. There are many reasons these changes have taken place. Over the last four decades, mortality rates have declined, education levels have improved, and many jobs are no longer as physically demanding as they used to be. This gradual shift in demographics has led to the need for changes in safety policies around the workplace. Older workers have specific requirements in the workplace. Prioritizing those needs can reduce the number of workplace accidents, and may even save lives. If you’re in a business with older workers to think about, you may consider the following. Slippery floors in bathroom and kitchen areas. Once these problems have been identified, take action to correct the problem. Sometimes replacing a light bulb or cleaning up a workstation is all that’s needed to make the workplace safer. Other times, bigger changes need to be made to correct an existing problem. Improvements to a building can be made strategically and with future needs in mind — not unlike how a home may be modified for aging occupants. Budgeting for workplace upgrades is important to ensure that workers have a safe environment. Set aside money the safety committee can use to make changes like installing grab bars, additional lights or non-slip floors. In addition to regular safety inspections, ergonomic assessments are also a productive way to protect workers as they age. Screen magnification, sit-stand desks and chairs with specialized back support can all help older workers. Larger businesses should have someone on site who is trained to perform ergonomic assessments. Smaller businesses may need to work with an independent consultant. Ergonomic assessments should be performed every time a new worker is hired, a new work station is established, and every time a person switches jobs. 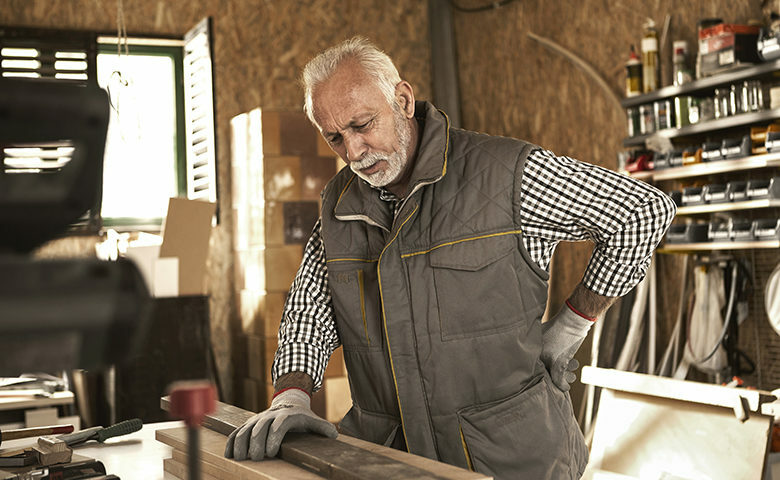 Jobs that require repetitive physical activity can be hard on the body, and this is especially true for older workers. Rotating job functions to exercise different muscles and reduce stress on overused muscles can help older workers maintain productivity. Rotate job functions among workers to ensure that older employees are able to perform their duties safely. Scheduling flexibility helps older workers who have different energy levels compared to younger workers. The ability to take breaks at will and when needed will help workers get through a long day. Other workers may need to work part-time. Older workers experiencing health problems may need time off to go to medical appointments. Finally, older workers who have been injured may need a longer recovery time. Scheduling flexibility can help older workers stay productive or get back on their feet sooner, and contribute around the workplace. Health declines with age. However, encouraging workers to maintain a healthy lifestyle can prevent or slow many health problems. Promote exercise. Encourage employees to stretch before safety meetings and staff meetings; send work-place emails promoting safe exercises to do at a desk or work station. Make educational literature available. Place educational literature about living a healthy lifestyle in common areas around the workplace. Organize events that promote health. Promote good health by organizing events like a salad bar potluck for employees. The most helpful thing that any business could do to ensure that their workplace is safe for older workers is employ a trained safety professional with experience in managing safety risks for older workers. A good safety professional can devise strategies that can help business owners to maintain a safe and productive work environment. Kris Lindahl is a nationally recognized innovator in real estate, marketing, leadership and community involvement. In 2014, he was Minnesota’s #1 real estate agent as ranked by Real Trends. In 2017, the Kris Lindahl Team rose to become one of America’s top real estate teams. And in May 2018, he fully embraced his own real estate model to form Kris Lindahl Real Estate, Minnesota’s premier independent real estate agency.